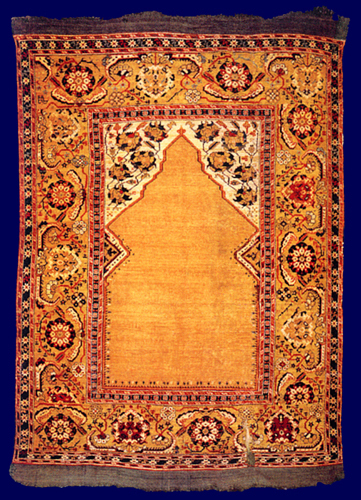 This rug differs little from the previous example, but has been selected because it demonstrates another of the ivory-ground floral spandrel designs typical of this type. On a number of these rugs the outline of the spandrel includes an extra lobe on each side: here it takes the appearance of a half-medallion, the other half being cut off by the border, whereas on the previous rug (exhib no. 27) it is seen an extension of the spandrel pattern. On two rugs preserved in the Black Church, Brasov, further lobes continue down the sides and join along the lower edge of the field. The inscribed date on the Mays rug marks when it was donated to the church in Sibiu.